We’re most famous for our colourful pressed tiles. Once they’ve been designed and plaster moulds have been made, we can then produce them in great numbers. The first stage is to roll the clay out with a rolling pin, then put the clay through the slab roller which makes the clay perfectly flat. The clay is then cut to size, placed under the mould and pressed in the tile press. When it’s pressed, the edges are carefully trimmed and the tiles are left to dry slightly. After about half an hour, the tiles can be removed from the moulds and left to dry fully. It takes a couple of days for the tiles to dry completely before they are ready to fire for the first time. This is called bisque firing. After firing, the tiles are painted with brush-on earthenware glazes. This is a very detailed process and the potters need to paint carefully. When this is complete, the tiles are fired a second time. This is called glaze firing, and is the final firing. The finished tiles can then be framed for people to hang on the wall, or sold individually for people to use as bathroom and kitchen tiles. Screen printing is a process that creates a detailed photographic stencil on a screen so that you can print detailed images onto a variety of materials. As our potters draw so many beautiful images, we wanted to be able to print some, as well as use them for our ceramic designs. The process enables us to put the images onto cards, bags, aprons, T-shirts, and flat clay. It creates a lovely effect! Brandon Trust is a leading learning disability charity. Our goal is to set people free to live more fulfilled lives. One of the ways we do this is to operate a series of social enterprises. 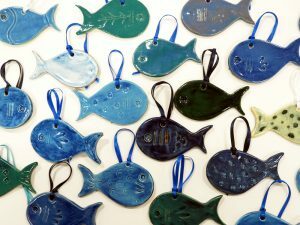 A friendly and fun studio, Banwell Pottery is one such enterprise. We offer work experience and training opportunities to people with learning disabilites and autism. We also run an evening pottery class which is open to the public.